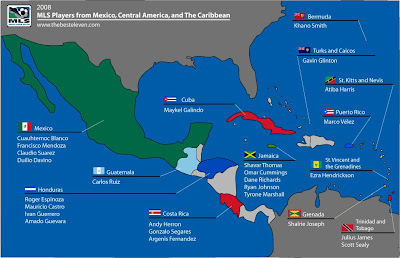 A map and list of MLS players from Mexico, Central America, and The Caribbean. Houston Dynamo, DC United, and Real Salt Lake currently have zero players from this region. I debated Kurt Morsink, Jeff Cunningham, and Andy Williams. I ended up leaving Morsink off because he is listed as "USA" on the MLS official player rosters. I left Jeff Cunningham off because although he was born in Jamaica he has been capped as a US international, making him in my mind, a "US" player. On that logic, I probably should have included Andy Williams, who has been capped by Jamaica but was born in Canada. I mostly didn't include him for the un-scientific reason that I ran out of space. I do appreciate the help, if anybody notices anything else let me know and I'll do my best to fix it. I really wish that the list of Mexicans in the league exceeded four.